Who Says Granola Has To Be Expensive? Preheat oven to 250 degrees F (120 degrees C). Lightly grease a jelly roll pan. In a large bowl, combine oats, almonds, wheat germ and sunflower seeds. In a separate smaller bowl, combine honey, brown sugar, vegetable oil, water, salt and vanilla. Stir well, then pour into the oat mixture and stir. Spread out on the jelly roll pan. Bake for 1 hour, stirring every 15 minutes. Remove from oven and cool before serving. The mixture may stick to your pan slightly, but that’s ok. Just get a sturdy spoon and kind of scrape at it until it is unstuck at each stirring interval. It will still taste fine. Also, make sure to allow the granola to cool all the way before storing so that it becomes crunchy. 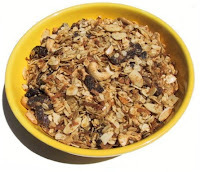 If you do not allow it to cool all the way, condensation could develop in the container and cause the granola to become soggy. Wait a sec….you might be wondering, what is wheat germ anyway? According to Wikipedia, wheat germ is the embryo of the wheat seed or kernel and contains a ton of nutrients such as Vitamin E & folate. When flour is milled and refined to make white flour, the germ and also the bran are stripped away from the wheat kernel. The germ and the bran are the two most nutritious parts of the wheat kernel which is why whole grain wheat flour is much healthier for you as it contains both the germ and the bran. So where can you buy wheat germ? I bought mine at my local grocery store. It comes in a glass jar and should be located in the baking aisle near the flour. I’ve also seen it in the bulk bins at all natural food stores such as Whole Foods. Wheat germ contains natural oils and should be kept in the refrigerator to stay fresh. So is it worth it? I say YES! The whole process only takes about 90 minutes including cooling time and you get a very large batch of granola in the end. It is very cost savvy as well. Those tiny boxes of granola at the grocery store are quite expensive! By making it yourself you not only save money, you also get to make it however you want. So if you don’t like sunflower seeds, take ‘em out! Trade in the almonds for some walnuts or add in some dried fruit. Throw in a teaspoon of cinnamon for a different flavor. Use molasses instead of honey. The possibilities are endless!